1 January 1914: a New Year’s Day characterised by huge tensions in Ireland dominating British politics, the world’s first scheduled commercial airline flight taking place in Florida and in Johannesburg Jack Hobbs inspiring England’s cricketers towards victory in a Test Match against South Africa. But what could not be foreseen that day was the event which would define 1914 in all of our thinking – the outbreak of the First World War. Over the past few months, as the centenary has drawn closer, much has already been published. Why the First World War happened, what happened during it and its consequences are all questions still being debated. As we enter 2014, we at the BBC are about to begin a four-year season to commemorate the events of a century ago and help people understand them better than ever before. That challenge to shed light on what is still a partly understood or even mis-understood conflict is at the heart of our plans. In mid-December, I was at a recording of one of our programmes - The Pity Of War - during which many of the key questions and issues about the First World War were debated. Professor Niall Ferguson of Harvard University put forward his views about the war and its impact and was challenged both by a panel of academics and the students who were in the audience. It was an illuminating discussion which you will be able to see on BBC Two in March. At the same time we will be offering a range of other debates about the war – on radio and online as well as on television, where Max Hastings for example will be giving a very different perspective from Niall Ferguson’s. The BBC is uniquely placed not just to put forward facts but also to share a whole range of opinions with the aim of leaving us all in a better position to make up our own minds about what happened and why. 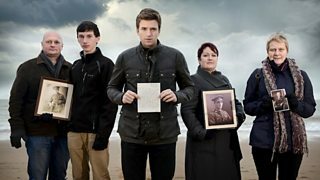 Before these debates, our season on television will begin at the end of January with BBC One’s Britain’s Great War presented by Jeremy Paxman – telling the story of the war and its impact on Britain. In February we will start sharing the original stories we have discovered from places and communities across the United Kingdom as part of our World War One At Home project. On BBC Two the drama 37 Days will tell the story of what happened in the capitals of Europe after the trigger pulled by Gavrilo Princip in Sarajevo started the sequence of events which changed the world for ever. Fergal Keane will tell the story of Teenage Tommies (pictured) while Royal Cousins at War will look at the impact of the war on the intertwined world of Europe’s monarchs. On radio, Radio 3’s Music on the Brink in early January (6-11 January) will take you back to a very different Europe musically and culturally – a world to be lost over the following four years. On Radio 4 Michael Portillo will examine how successive generations have interpreted the war in such different ways whilst special editions of Woman’s Hour will consider how the war changed the role of women. Online we will be adding content regularly to our special site at bbc.co.uk/ww1, starting with a series of interactive guides looking at some of the key aspects of the war from the use of trenches to the impact of the poets. These are just some of the early highlights from what is the most ambitious season the BBC has ever put together. From the middle of January we will be running a series of on-air trails to give a flavour of what we are doing across the BBC as a whole and within individual programmes. The highlights outlined in this blog give a glimpse of what to look out for and listen for a special arrangement of the iconic First World War song Pack Up Your Troubles which will be the soundtrack for the overall season. There will be much more in the months and years to follow particularly as we approach 4 August – the actual anniversary of Britain’s declaration of war on Germany. Even 100 years later the scale and impact of the First World War is hard to overstate – our aim is that the range and quality of our programmes and content will meet the challenge of illuminating and unravelling the conflict which did so much to define who we are today. Read A look ahead to WW1 - Music on the Brink from the Radio 3 blog.